West Coast managed to beat Melbourne by 6 points in an ugly slog at Subiaco Oval, despite getting far fewer inside 50s than their opposition. The Demons recorded 66 inside 50s to the Eagles’ 37, a net inside 50 differential of -29 to the home team. It is quite rare for a team to be so comprehensively beaten on the inside 50 count, yet manage to win the game. In the 3411 home and away games played since the start of 1998, only 156 games have featured an inside 50 differential of 29 or more. In 152 of those 156 games, the team that won the inside 50s won the game. The Eagles were just the fourth team over this period – spanning nearly two decades – who managed to get so comprehensively smashed in the inside 50 count and still come away with the four premiership points. On average, each net inside 50 is associated with an increase of 2.28 points in the final margin. Given this relationship between inside 50s and margin, you’d expect a home team that lost the inside 50 count by 29 to lose the game by 64 points, not win the game by 6 as the Eagles did today. 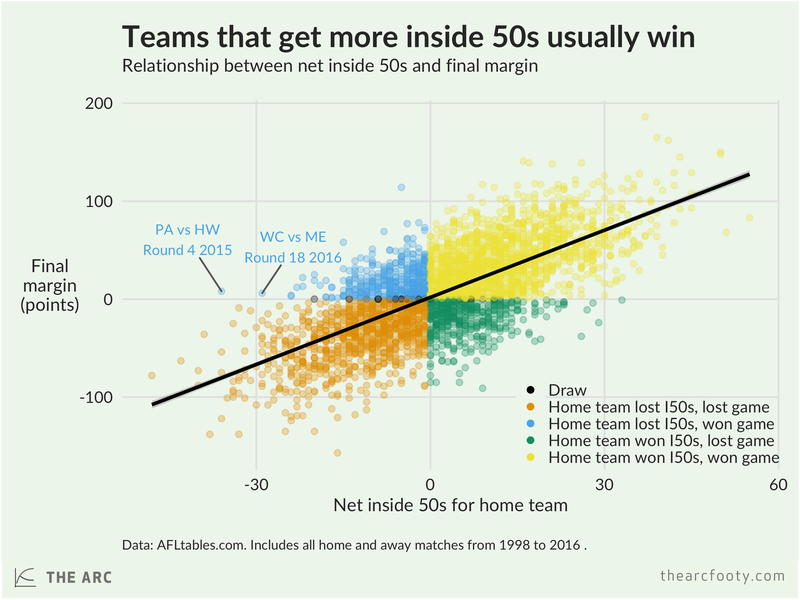 The net inside 50 count is a pretty reliable guide to which team will win. Out of the 3411 regular season games since 1998, the team that won the inside 50s won the game 74.4% of the time. The Eagles got very lucky today. NOTE: the figures in this post include games up to and including Round 17, 2016, plus the Eagles-Demons game in Round 18. They do not include other Round 18 games. 1. This is the estimated coefficient from a bivariate regression, which doesn’t take into account other statistical measures, such as contested possessions. The standard error on the slope coefficient is 0.03, highly statistically significant. The intercept is 1.82 (indicating a slight home team advantage even when net inside 50s are 0), also highly significant. R2 in the bivariate linear regression is 0.515, indicating that the net inside 50 count ‘explains’ 51.5% of the variation in margins.